MANSFIELD, Mass. – The first time Attleboro and Mansfield met, the game went to overtime before a winner could be decided. 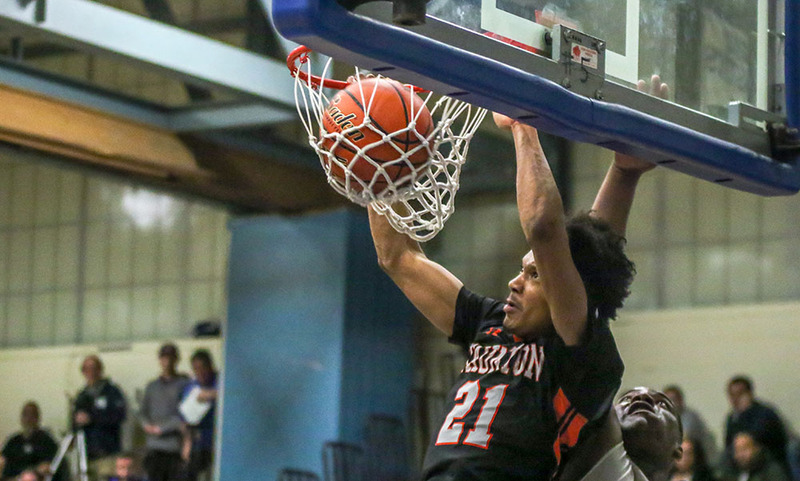 On Friday night in the Albertini Gym, it looked like the two teams could be headed for another extra period when the Bombardiers battled back to tie the game at 53-53 in the fourth quarter. As they had all game long, the Hornets made shots when they needed to, closing the game on a 10-4 run and sealing a 63-57 win that split the season series against the Bombardiers and forged a tie atop the Kelley-Rex division. T.J. Guy got the Hornets off to a good start to the game, scoring the team’s first seven points, including a three-pointer, to take an early lead. Sam Stevens hit his first of three from beyond the arc to extend the lead to 10-4. Attleboro climbed back into the game by getting the ball into the post to junior Qualeem Charles (21 points and 17 rebounds). He scored eight in the first to keep the Bombardiers close. Tim Callahan drilled a three to get Attleboro back within three but then Damani Scott (11 points and 11 rebounds) answered with one of his one and finished with Mansfield’s last eight points of the quarter to give the hosts a 22-17 edge. Tommy Dooling (10 points) got free on back-to-back possessions in the second and drilled a pair of threes to extend the lead to 30-19, which was the largest of the night. Even without injured point guard Bryant Ciccio, the Bombardiers kept finding ways to hang around. Charles got a three-point play off a Mason Houle assist and then Houle (nine points) got a steal and assist for a Kevin Velazquez transition basket. A Matt Boen three pushed the lead back to nine, but a Charles layup off a Nick McMahon feed and a pair of baskets from Houle kept Attleboro within seven, 37-30, heading into the break. The Bombardiers cut the lead down to four at the start of the third quarter, but every time Mansfield would have a response. This time it was Boen drilling a corner three from a Dooling assist and then Stevens got going with seven points in the quarter. 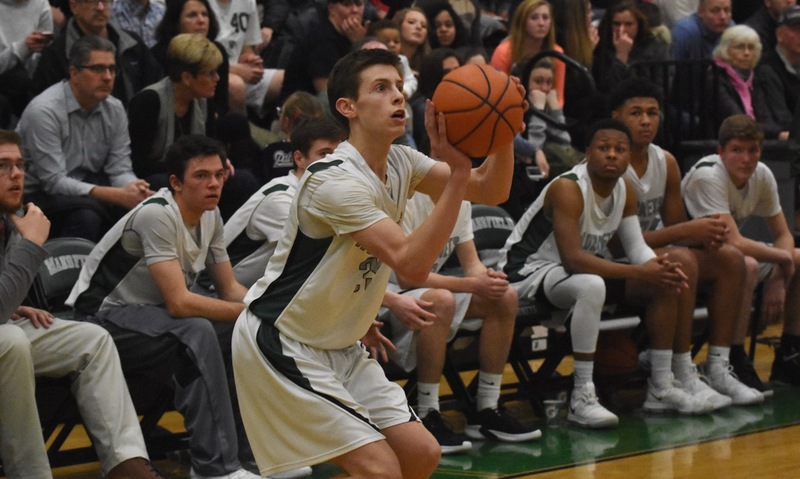 When Boen (12 points) hit his second three of the quarter, and third of the night, the Hornets led 53-42 and felt on the verge of putting the game out of reach. Instead, Attleboro rallied with 11 straight points. Callahan hit a three and McMahon beat the buzzer with a pull-up jumper in the final seconds of the third. Callahan hit another to start the fourth and Charles scored off a Houle assist and got fouled on an offensive rebound to tie the game. After a Scott free throw, Stevens got a good look at a straightaway three and nailed it to make it 57-53. Dooling beat his man for a layup and then Scott followed up a miss with a rebound basket to put the home team up seven with time running out. With the Hornets struggling at the line, just 3-for-10 in the fourth quarter, Attleboro was still in the game and Houle buried his first three of the game to make it 61-57 with 43 seconds left. It just wasn’t enough for the Bombardiers as time ran out on the latest comeback attempt. The win moves Mansfield into a first place tie, but both teams have to run the gauntlet of division play over the final four games in the league. 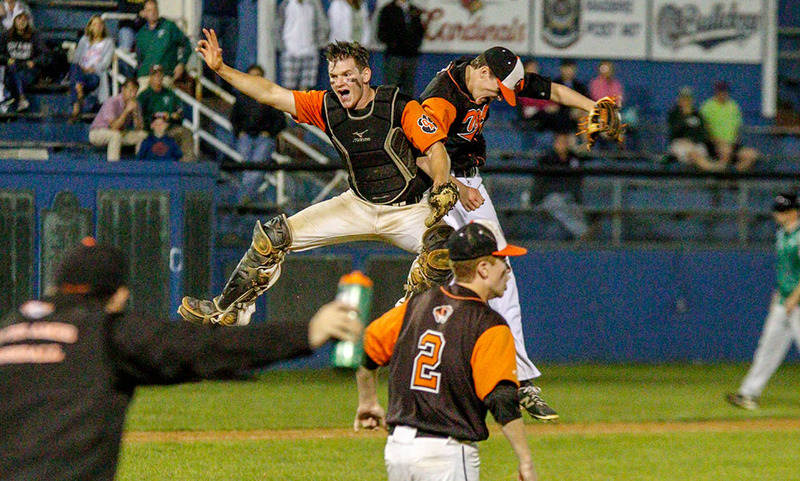 As Vaughan noted, Mansfield (14-2, 10-2) will travel to Franklin, which is just one game out of first, on Tuesday night. Attleboro (13-3, 10-2) will also be on the road, traveling to Oliver Ames, looking to stay in the hunt for its first ever Hock title. ATTLEBORO, Mass. 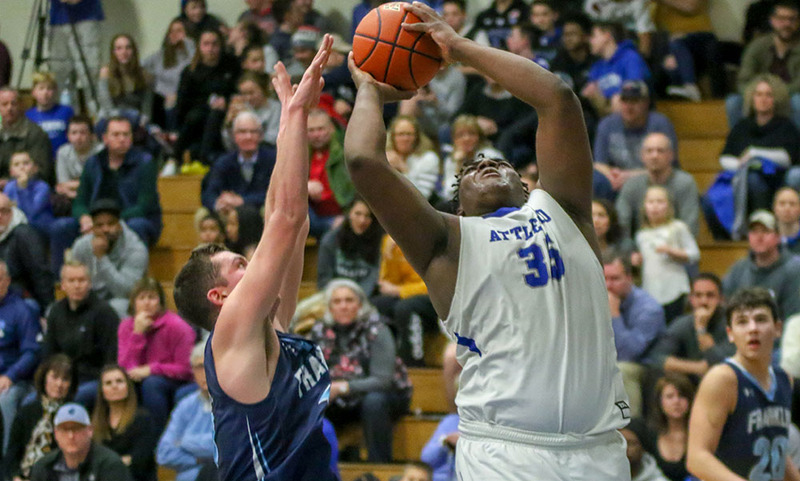 – Having to try and match up with Attleboro’s 6-foot-5, 295-pound center Qualeem Charles for 32 minutes is one of the toughest covers in the entire Hockomock League. Having to try and stop him for four more minutes in overtime just might be impossible. Franklin stormed back from a 15-point fourth quarter deficit to tie the game in the final seconds and send the game to overtime but Charles scored half of Attleboro’s points in the overtime period to help the Bombardiers secure a 51-46 decision in overtime. Charles scored 13 of his game-high 18 points after halftime and hauled of his 17 rebounds after the break as well. After Mason Houle (nine points) and Will Harvey traded three-pointers to open the extra stanza, the Bombardiers got Charles going inside. Kevin Velazquez (six points, nine rebounds) found the big man in the post and Charles used a nice post move to go up two. The teams traded misses before Attleboro came up short on a Tim Callahan three. But Callahan was quick to hustle back on defense and drew a charge to get the ball back with 1:32 to play and a 46-44 lead. Attleboro went back inside and Charles was fouled, hitting one of two attempts to extend the lead to 47-44. Franklin missed a three and Charles came down with a big rebound. On the offensive end, the Panthers’ collapsed to try and cover Charles, allowing Velazquez to take it strong to the basket for two. Franklin once again came up short on a layup attempt and Charles hauled in the rebound while being fouled. He hit two free throws to give Attleboro 51-46 lead with 28 seconds and that’s how the game finished. After putting up just five shots in the first half total, Charles attempted five field goals in the third quarter and then went 2-for-2 in the fourth. There wasn’t much happening for either side in the first half. The teams combined for just six made field goals in the opening eight minutes with Franklin senior Jalen Samuels (eight points, 10 rebounds, five assists) finding Thomas Gasbarro for a layup right before the buzzer to give Franklin a 9-7 edge. But that would be the last field goal Franklin would make for the half. The Panthers were held scoreless for nearly the entire second quarter. Sean Leonard hit a pair of free throws with 26 seconds left to get Franklin on the board. Meanwhile while Attleboro’s offense didn’t exactly catch fire, it was able to use an 8-0 run over the first seven minutes. Bryant Ciccio and Nick McMahon made shots while Callahan and Houle sank two free throws apiece. A late bucket from Charles gave Attleboro a 17-11 lead at half. The offenses for both sides came alive to start the second half. The Panthers matched their first half production in just over five minutes in the third quarter. Buckets from Chris Edgehill (12 points, eight rebounds), Jake Macchi, and Leonard brought the Panthers within two, 24-22, with 3:46 left in the third. Attleboro answered with a 10-0 run to close the third quarter. Ciccio, Charles, and Houle hit back-to-back-to-back layups, and McMahon converted down low after a nice offensive rebound and pass from Velazquez to give the Bombardiers a 32-22 advantage heading into the final quarter. It appeared the Bombardiers had the game in hand when they pushed the lead to 37-22 on a Callahan triple, a 15-point advantage with six minutes left. But Attleboro’s offense stalled as the Panthers continued their pressure defensively. And over those six minutes, shots began to fall for the visitors. Steve Karayan drained a three after a steal from Will Harvey then Edgehill drained a transition three after an Attleboro turnover to make it 37-31 with three minutes to go. Samuels hit a free throw and Harvey came up with another steal that led to two made free throws, cutting the deficit to 37-34 with two minutes left. After a five-second call on the inbounds, Harvey sank another free throw to make it 37-35. Attleboro finally got some points on the board when Callahan hit Charles down low and the junior converted with a nice spin move. But Karayan drained another triple to make it a one-point game with just over a minute to go. Velazquez missed but was fouled as he hustled for the offensive rebound and he sank two free throws with 42.6 to play. Franklin came up short on the tying three, but the offensive rebound was batted out and corralled. Attleboro chose to foul with a three-point lead with 8.4 to go. The strategy worked as Franklin missed both free throws but the rebound was batted out to Edgehill, who alertly made an extra mass to Karayan for a straightaway three-pointer with 2.4 left, sending the game into overtime tied 41-41. “We found something that was working down the stretch,” Neely said.”But in the end, we weren’t ourselves in the first half. We weren’t playing the way we needed to play if we wanted to win. You can get away with that sometimes but not on the road at Attleboro in a big game tonight. We played good defense in the first half but they opened it up in the second half. I’m proud of them, they stuck with it. They shared the ball and got back into the game. Free throws hurt us, and that’s cost us basically in every loss this year. It’s frustrating to have a good offensive possession and get to the line and come away with nothing. Attleboro boys basketball (9-1 Hockomock, 12-2 overall) is back in action on Tuesday on the road at Milford. Franklin (7-3, 9-4) is also on the road with a trip to Sharon on tap.